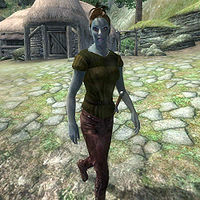 Satha Dalvilu is a Dunmer farmer residing in Bleaker's Way, a peaceful village in the Great Forest, inhabited by the Dalvilu and Ulfgar clans. She lives a relaxed life in the small village and while she occasionally socializes with both her own clan and the Ulfgars, she spends the majority of her time at home. She sleeps every night between midnight and 6am and always starts the day with a two-hour breakfast. At 8am, and only if you have reached stage 30 of the related quest, she heads outside for her daily chat with family patriarch Nivan Dalvilu who is always wandering near her house in the morning. She goes back inside at 10am and strolls lazily around until 2pm when she heads for the towns popular gathering point, the Bleaker's Way Goodwill Inn, for two hours of socializing. She returns back home at 4pm and spends the rest of the day inside, until she goes to bed at midnight. The exception to this routine occurs during the final stages of the Mephala quest, when she learns that the Ulfgars are responsible for the untimely death of Nivan. She will then run head first into battle against her former friends and hack away with her iron dagger until she or the entire Ulfgar family is dead. If she survives the confrontation, she will return to her usual routine, but will stay inside her house between 8am and 10am. She wears a typical set of lower-class clothing, a dark green shirt with laced leather pants and matching leather shoes. She carries her house key, her dagger and a small amount of gold.